It's a pinch of City of Angels with a smidgen of Constantine and a dash of Michael. 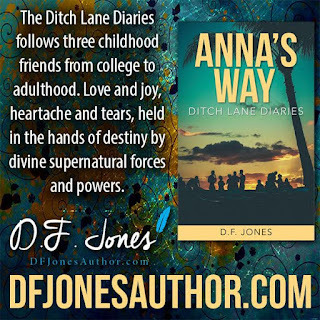 The Ditch Lane Diaries begins in 1977 and follows three childhood friends (Anna, Ruby and Sandy) from college to adulthood. Love and joy, heartache and tears, held in the hands of destiny by divine supernatural forces and powers. A healer, a dreamer and a soul reader on life's journey of discovery to true love and how to use their divine gifts. A splelunking adventure changes Annaâs life forever. She receives the ability to heal through a divine power and meets her guardian angel, Ralph, who teaches her how to use her gift. Anna's power grows stronger with every passing year as does her drive to become a doctor. When Anna receives an out of state scholarship for medical school, her love for Jerry has her torn. She has been in love with Jerry for most of her life. 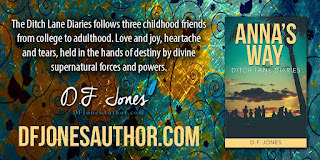 Does she pursue her dream, her divine calling at the risk of losing true love? 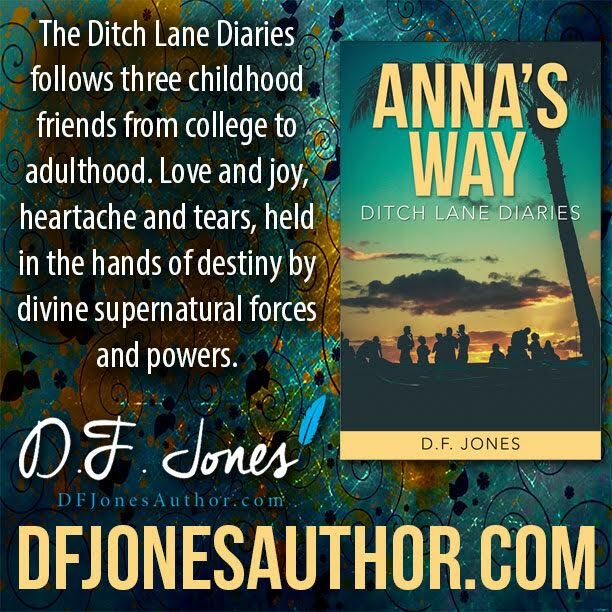 The Ditch Lane Diaries is a paranormal romance that includes angels and demons with metaphysical and visionary elements fighting an angelic war over Earthâs humans. The many twists and turns give the reader plenty to contemplate over life choices. 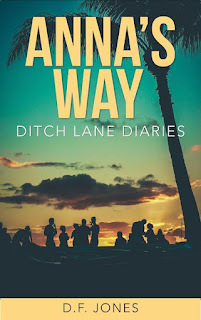 The Ditch Lane Diaries is for readers Adults 18+ and trending Women 35+ with a medium heat level. 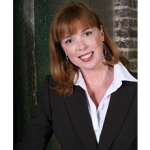 After years of developing creative advertising for my clients through my media company, I had the compelling desire to write something for myself. If you love to read and get immersed into the characters of a book, then you will catch a small drift of how incredible it is to write your characters and breathe them into life. I fell in love with writing and trust you will enjoy my books. A little about me: After graduating MTSU, I landed a job as a broadcast consultant at the ABC Affiliate in Nashville, which led to me opening my ad agency. Iâm happily married to the love of my life and my best friend, KJ. We have two gorgeous sons whom I love and adore more than life itself. I love to laugh, and my husband keeps me in stitches! If you are going to self-publish find a good editor, proofreader and formatter. Hire a professional to design your cover. Editor: A good editor will make or break your book. You donât have to stay with an editor or a publisher if you are uncomfortable with their feedback or lack of feedback. Read the fine print of any contract. If your gut is telling you something isnât right, trust it and move on. Writerâs Beware is a site which offers insights on individuals and companies that do not have good reputations. Review this site! You need to find an editor that works in your genre. Itâs important to relate well with your editor. If it doesnât work or your stressing about it, look for someone else. Beta Readers: During your second pass find Beta Readers Theyâre a godsend. Listen to their comments. If you have two or three betaâs saying the same thing, then it is a good rule of thumb to revisit your manuscript for a tweak. Proofreader and formatter: You may want to find a good proofreader after your manuscript has finished its last pass. By the time you make it through your third pass, your brain has a tendency to auto correct mistakes. My brain auto corrects in any passâ¦.And then lastly, find a good formatter. You want your manuscript to be polished. An editor, proofreader and formatter will help you accomplish your goals. Bookcover and marketing. Hire a professional. If you are not a designer, then donât design your book. If you want to be taken serious, then have a seriously professional book cover, website and even social media ads. Once youâre book is published, donât rest on your laurels. Start writing again even if you only write scenes. Remember, not everyone will like what you write, at the end of the day, it is your book. As long as you love it and youâre happy, then someone out there will love it too. 1. When do you write and how often? I write either in the morning 7-9 am or from 9 pm-12 midnight. Iâm a night owl. Iâm most productive at night. There are times when I write all day long when the mood hits me. But, as I rule, I write two to three hours a day. Any more than that and you risk burnout. 2. Can you tell us about your current work in progress? Sandyâs Story is the third installment of the Ditch Lane Diaries, coming this fall. Sandy has a secret that no one else knows except her guardian angel, Baldric the Warrior. The storyline delves into the growing relationship between Sandy, the clairvoyant or soul reader and Baldric the Warrior and the rules of Heaven that prevent them from being together. 4. Whatâs your favorite item on your writing desk? Photos of my smiling sons. 5. Whatâs your favorite genre and why? Paranormal Romance, Fantasy with metaphysical and visionary elements. I also like writing about Time Travel. 6. Any advice for those who want to write or new authors? I still consider myself as a newbie. It is important to cultivate friendships with other authors. I have met so many wonderful authors. I know a lot more now than I did last July when my debut novel, Rubyâs Choice went live. 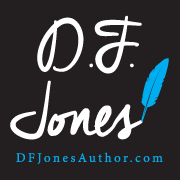 I made the decision to self-publish. Itâs important to research. Join writerâs groups. Attending writing workshops. Write daily and never give up. See your story through until the end. Whether itâs a napkin or my IPhone, I have pages and pages of notes. Do not allow any negative comments or reviews to stop you. I love my books and I want readers to love them. However, I know everyone will not like my books. In the end, itâs my book and I love them! 7. What do you do when you are not writing? What do you do for fun? I love spending time with my family and friends. Whether its going concerts, restaurants or football games. Laughter is the key to happiness. I try to live by my momâs motto, itâs better to laugh than cry. 8. What else would you like to share with your readers? Life passes by in an instant. Be happy in life. Donât let the darkness and negativity get you down. My new tagline line that I sign in my books, âMay love light the way.â Corny maybe, but I like corn! I meet Jerry for our interview at his Tech World offices. Itâs a sleek grey and black building with floor to ceiling windows. His receptionist Sarah takes me to the second floor where his assistant Kaye meets me at the elevator doors and offers me a cool glass of sweet tea and I accept. Itâs late summer and Tennessee is scorching hot. The door to Jerryâs office opens and he is smiling down at me. This gorgeous six foot three blond with piercing blue topaz eyes reveals the most irrestible dimples. He has broad shoulders and narrow hips. The kindness in his face puts me at ease at once. Jerry: Welcome Ms. Jones. Iâm glad to meet you. (I go to shake his hand and he hugs me which makes me a little weak in the knees. Jerry radiates light and his laugh is infectious.) Iâm a hugger. Come on inside and take a seat. D.F. Jones: Thanks for meeting me today on short notice. Hey is that a Chris Chambliss jersey? My dad is a huge Atlanta Braves Fan. D.F. Jones: So, Jerry, what made you go into software development? D.F. Jones: Well, yes, I do believe in destiny. Do you? (This time Jerry burst out laughing and I start laughing too, although Iâm not sure what Iâm laughing about. D.F. Jones: Hey, Iâm the one that's supposed to be asking the questions here. But yes, I believe in angels. Do you? Jerry: (He drags his fingers along his beautiful face. He has the face of an angel) Iâve met angels. Thereâs actually one in the room with us now. Luwenia, show yourself. Jerry: I tried, but sheâs a little shy around new folks. Sheâs a warrior angel. D.F. Jones: (The hair on my arms stand straight up and I feel a prescence in the room. I shift in the seat uneasily. ) Huh, so, where are you from Jerry? Jerry: (He leans back against the couch) Iâm from Everglade, Tennessee. Itâs a peaceful place with a slow, gentle rhythm to everyday life. Everglade has two-lane streets lined with hundred-year-old maple trees and, in the distance, the rolling hills of the Highland Rim. Everyone knows each other and you can leave your doors unlocked at night. D.F. Jones: (I smile) It sounds like a wonderful place to live. Jerry: It is, you need to drive out Salem Highway one day and stop by the general store, one of my best friendâs works there. Ruby makes the best bread. D.F. Jones: Sound delicious. Jerry, what do you want from life? Jerry: (He scratches his head and looks toward the ceiling like heâs contemplating the answer. Then he pins me a look that has the air backing up in my lungs) I want happiness. Success is great and I love to spend money, but happiness will make the rough spots smoother. I want to marry the girl of my dreams if she says yes. D.F. Jones: Sounds like you have someone in mind. Jerry: Aw, I do. I love her something awful. Just being in the same room with her makes my day and nights worth living. D.F. Jones: (I sigh) Could you describe yourself to me? D.F. Jones: So, what do you do to chill out? And what do you do with your friends that you donât normally donât do with your family? D.F. Jones: You mentioned your girl. Was it love at first sight or did you will fall in love over time? Jerry: (He chuckles again) Well, it wasnât love at first sight. I dated her best friend in high school. She practically had to hit me over the head. But it was love at first kiss. From the first moment I kissed her, I knew I would never feel the same again. D.F. Jones: Sheâs a lucky woman Jerry. I hope she knows it. Well, thatâs about it. I appreciate your time. Jerry: Oh, Iâm the lucky one because she loves me too. Youâre very welcome. You stop by and see me anytime youâre in this neck of the woods. (We both stand and I start to shake his hand) You know Iâm a hugger. Jerry gives me a hug and walks me all the way to my car and even opens the door. His chivalry and kindness are quite remarkable. Yes, his girl is very lucky indeed.